Support Maasai Girls to Go to School! Have you been looking for a way to contribute to a meaningful cause? Here’s your chance! Meet my sister, Rafaelle! 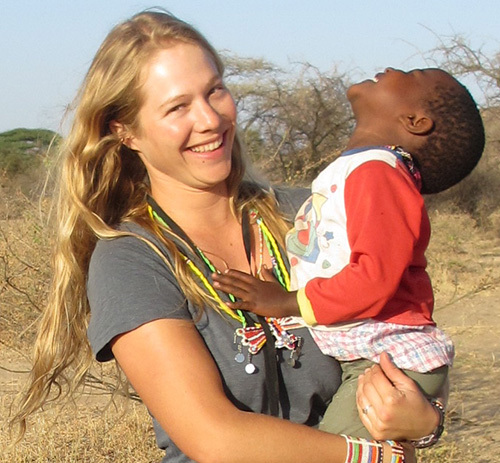 Over the past 8 years she has been involved with teaching and living in a Maasai community in Kenya. The Maasai are a pastoral tribe of indigenous people spread between Kenya and Tanzania who still live very traditionally. The last century has seen the Maasai people displaced and dispossessed of much of their ancestral tribal and grazing lands. Now in the 21st century, they are caught in a difficult struggle, trying both to hold on to the beauty and history of their traditional lives and to stay connected to the modern world. One of their biggest challenges is to get access to education, due to the expense and the lack of local schools. Girls have an even more difficult time getting access to education because boys are often given priority if the family can afford to send some children but not others. When Maasai girls do get the opportunity to go to school they are given more choice and power in their lives. It often makes the difference between whether they will be circumcised or not and whether they will get married off at a very young age. Educating these girls will rescue them from the abuse, physical harm and trauma they go through in these circumstances. Many people around the world who are working toward change on a global scale believe that one of the most important things we can do is to educate young women and give them opportunities for leadership in their communities. There are many, many young girls who long for the chance to go to school, and whose families cannot afford to send them! Lenana Empowerment Education Project (LEEP) empowers young girls by providing them with the opportunity to access life changing education. We have already raised enough money to send 101 young girls to school! We are hoping to be able to continue to support them and to add more girls to the list! Any size contribution makes an enormous difference! Rafaelle’s connections with this particular community makes the giving simple and direct. Her non-profit organization NARETOI, sends the money directly to the schools. It employs responsible Maasai community members to checks up on the girls when she visits Kenya. You can be assured that 100% of your contribution goes directly into the student's sponsorship. Your contribution can either take the form of a simple donation to the cause, or if you’d like to fully sponsor a specific, individual girl annually, we can help you find a girl in need and keep you informed of her progress! $650 per year pays for tuition, boarding, supplies, and transportation. $65 per year pays for tuition and supplies at a local day school.